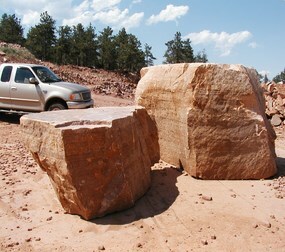 Loukonen Bros. Stone offers Quarry boulders to the Denver, Longmont, and Boulder area. This natural stone is available for use as landscaping rocks, large retaining wall stones, walkways or traffic blocks. If you are interested in learning more about our Quarry boulders , contact Loukonen Bros. Stone today. Size: Random sizes that range from 50 lbs to 6000 lbs. Thickness: Red & Buff Quarry blocks are generally angular with flat tops & bottoms. Coverage: Ton covers estimated 100 sq ft per ton. Uses: Retaining Walls, Decorative Boulders, Traffic Blocks. BUFF-Most materials are a Gray base color and range from light gray to Tans to Browns/Bronze.